Today we started building a new home for clients. We hope to be able to take you on the journey with us. We will do regular updates for you and will also post pictures of the site and home. The site is ideal in that it is close to 2 acres in size and has beautiful north-facing rural views. The clients have been very clever in selecting a block that is ideal for building a solar passive home. Now this is not always possible but there are ways to work with what is available to you. Almost any block can be worked to use the sun’s potential to heat your home. As discussed in earlier posts, the layout of the home and the materials used are big elements in capturing the sun’s potential. We were able to sit down with our clients and discuss what they wanted in a home and then develop that into an ideal house plan that not only became a very efficient solar passive design, but also the perfect layout to suit the family. As you can see from the picture above, there are amazing views from the north of the property – farmland as far as the eye can see. 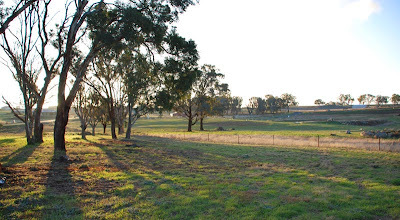 This land is only 25 minutes drive from the centre of Canberra. We hope you will follow us in this venture and be inspired to design an inspiring energy efficient home of your own. Design and siting are crucial to building an energy efficient home in the Canberra region. By making use of our clear, sunny winter days and relatively cool summer nights it is possible to build a comfortable home that does not require active sources of heating and cooling.In wintertime this means maximising north facing window areas to allow the sun’s energy (warmth) into your home. This energy must then be stored in internal thermal mass such as a concrete slab floor or areas of internal brickwork. The stored energy needs to be retained through the use of good insulation in the external walls and ceilings. In summertime this means minimising the effect of the hot summer sun through use of roof overhang to shade windows. West facing windows should be minimised and well shaded and external walls and ceilings need to be well insulated. Cooling the home’s internal thermal mass overnight through good cross-ventilation helps to keep the interior cool the following day. Using these simple criteria will keep a house warm in winter (15-25°C) and cool in summer (20-28°C) without the need for heating or air conditioning. Today there are also many new appliances and fittings available that will enhance the energy efficiency of your home such as solar hot water systems, water efficient fittings and back to grid solar panels. Visit the gallery of homes we have built here in Canberra.